The PATC recently debuted its first electronic map for the iPhone, an app called PATC Shenandoah that features full content of Maps 9, 10, and 11, covering Shenandoah National Park. I purchased this app and thought it would be useful to put together a review. [Note: I am a member of the PATC Maps Committee, though I had no input on this product.] At the same time that I purchased the PATC app I also bought the app from National Geographic's Trails Illustrated, entitled Park Maps. Here is a comparison; it is not intended to be comprehensive. The app costs $4.99 and is currently only available for the iPhone - there is no Android version. When purchasing the PATC Shenandoah app, I also came across and purchased National Geographic's Park Maps app, also listed at $4.99, though I was only charged $3.99. Maybe it was on sale? Signing onto the PATC Shenandoah app, the user is greeted by the same statement: "USE OF THIS APPLICATION IS AT THE USER'S OWN RISK." In order to get into the map, you need to click that you agree. Every time. Really? Does the PATC's lawyer require this in order to minimize PATC liability? I don't have to acknowledge this when I unfold a paper map. It is an irritant and serves no apparent purpose. Once I get past that, a screen shows the entire SNP, along with at least 50 pins dropped in it. The pins represent places of interest, where a photo can be accessed. In standard iPhone. iPad, iPod manner, the user zooms into the desired section of the map using his/her index finger and thumb. Eventually, a map looking like the NPS map given to Shenandoah visitors comes up. When you scroll in a bit further, the familiar PATC map comes up. The PATC maps are actually updated more recently than the current versions of the print maps, as I noticed at least one trail (found within the Rapidan Wildlife Management Area adjoining the Park boundary) not on the latest edition of Map 10, covering the Central District. I also placed this map on the family's first generation iPad. At first the maps looked like they would be fuzzy - indicating an iPhone app that had not really been produced for the iPad, but it came in clear once the maps came up, and it is overall a very good resolution. 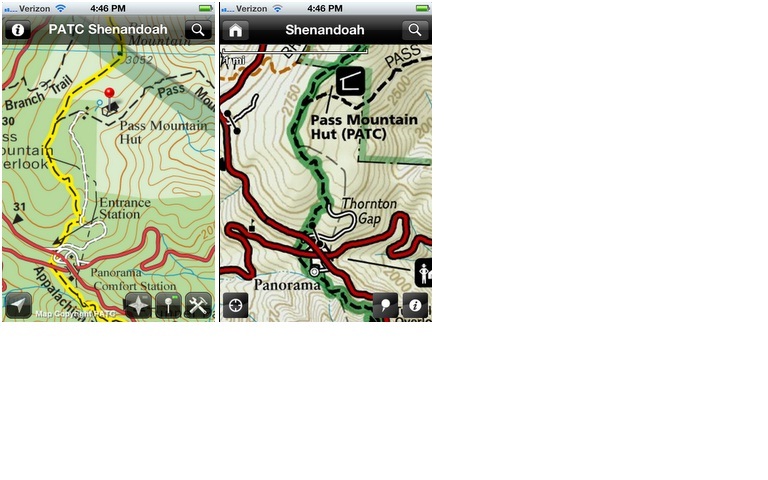 Above is a comparison of the two maps, showing the Thornton Gap area of Shenandoah National Park. Note that there is a road to the Pass Mountain Hut that is only shown on the PATC map. Overall, the PATC map has better detail. The PATC map also has a nice feature called the Line Tool, which allows me to estimate the length of a trail using my finger. And I love the option to locate where you are on a Shenandoah trail with the PATC app. What the National Geographic app offers is more map. For Shenandoah, the NG app offers nearly all of Massanutten Mountain - really nice if you want to check out the interesting rock formations in Veach Gap or try hiking to Strickler Knob. But wait! There's more! NG includes not just Shenandoah, but maps of 20 National Parks, ranging from the really popular ones like Grand Canyon, Yellowstone, Yosemite and Great Smoky Mountains, to less visited parks like Joshua Tree and Channel Islands. Just the thing to pass the time while waiting in line for lunch. The high def versions of these maps must be downloaded to the iPhone (no doubt so you don't use up all your memory), but I make due with a couple of well-used maps (Shenandoah and Grand Canyon) and a couple of others for dreaming, like Olympic. And even if you don't download the high def version, you can look at the standard issue NPS version of each park's map. The PATC app came out in mid-March with a new update, allowing for sharing of custom markers with others who have the app, a bug fix, and a "revolutionary new feature" called trail navigation. This apparently determines the fastest route from the starting and ending locations that the user has defined. Finally I should note that I have another app on my phone, called ATTrail 6. Though #6 does not cover much of Shenandoah - starting south of Roanoke, this app covers about 150 miles of the AT through the Calf Mountain Shelter in Shenandoah's South District. It is nice to have elevation profiles, which this app gives. But the app costs $2.00 for every 100-200 miles, dividing the AT up into 16 parts. And #6 has some bad data - although it lists the James River Foot Bridge, it does not show it on the map. It instead shows the older route used before the Foot Bridge was completed in 2000. A more recent AT reroute around Humpback Rock is also missing. Not recommended. So which app do I recommend? If you are just hiking Shenandoah, there is no question that the PATC map is superior. But I am happy I got both. This way I can dream of returning to Glacier National Park. Wow... yet another reason to buy an i Phone. Great write up. Cheers!